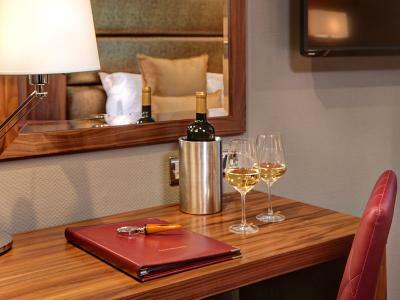 Standing in the Sevenoaks district – a short 10-minute drive (less than 3 miles) from the traditional Kentish town – Donnington Manor Hotel welcomes you with 15th-century pedigree and 21st-century hospitality. The centuries-old and the ultra-modern. Once owned by the sheriff of Kent (in the reign of Edward III), Donnington Manor wears its history well. Step inside and there is this same sense of time playing out against itself – contemporary artwork, specially commissioned for the hotel, sits alongside canopied porter’s chairs upholstered in a full-bodied red – used in medieval England to envelop the gatekeeper of an estate. Tread lightly, there are world-famous heritage sites and glorious evergreen gardens all about you. Kent is England’s oldest county, after all. The North Downs Way rolls alongside the hotel, and the National Trust’s Knole House, crowned by 1,000 acres of rippling deer park, lies at the heart of Sevenoaks. Take a leaf-crunching walk through woodland, or a cliff-top hike with the taste of salt-spray on your lips; the Kent coast is a mere 30 minutes by car. "Befitting your stay in the Garden of England" We say... You may well fall in love with your bedroom at Donnington Manor - gold and ruddy browns cosset, nay cocoon your mind in autumn's indulgent garments. There's a very big bed, a well-lit writing desk (find your inner-muse in this lush county), and a small occasional chair. With free Wi-Fi and air-conditioning, you're all set to surf, snooze, or sit back with a glass of smooth Merlot. Ooh yes. And your bathroom? Just let your eyes follow those clean lines inspired by understated Scandi style. In your room… Free Wi-Fi, air-conditioning, 40-inch Smart TV with Freeview, digital radio, laptop safe, writing desk, easy chair, newspaper, direct dial phone, alarm clock, ironing station, tea and coffee making facilities, Grohe rainfall shower, bathroom amenities, hairdryer, and key card access. Super-king-size Hypnos bed. 215 sqft en suite bedroom. Accessible? 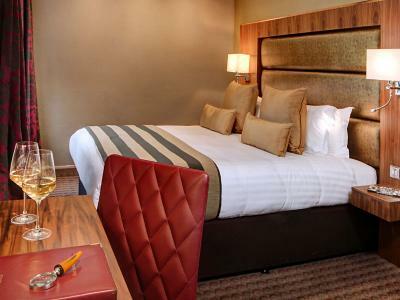 There are 17 ground floor rooms of which 1 classic twin is fully adapted for wheelchair access. Lift to all floors. Classic doubles feature a walk-in shower only. 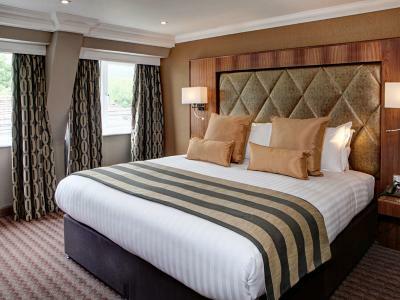 "Befitting your stay in the Garden of England" We say… As desirable as our classic doubles, but with 2 single beds (zip-and-link) instead of a super-king. In your room… Free Wi-Fi, air-conditioning, 40-inch Smart TV with Freeview, digital radio, laptop safe, writing desk, easy chair, newspaper, direct dial phone, alarm clock, ironing station, tea and coffee making facilities, Grohe rainfall shower, bathroom amenities, hairdryer, and key card access. 2 single Hypnos beds. 205 sqft en suite bedroom. Accessible? 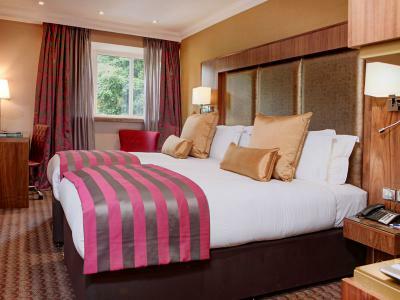 There are 17 ground floor rooms of which 1 classic twin is fully adapted for wheelchair access. Lift to all floors. Classic twins feature a walk-in shower only. "Befitting the sheriff of Kent. You're the boss" We say… Stay like the sheriff. Sleep like a baby. 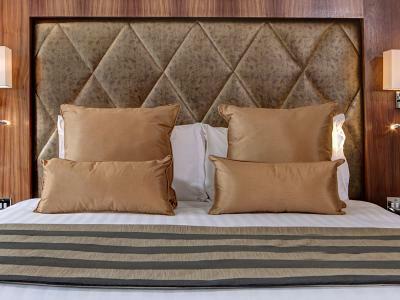 Choose an executive room for that extra space and comfort - you most cultivated and cultured one, you! In your room… Free Wi-Fi, air-conditioning, 40-inch Smart TV with Freeview, digital radio, fridge, laptop safe, writing desk, easy chair, newspaper, direct dial phone, alarm clock, ironing station, tea and coffee making facilities, Grohe rainfall shower, bathroom amenities, hairdryer, and key card access. Super-king-size Hypnos bed. 323 sqft en suite bedroom. Accessible? Executive rooms are located on the 1st floor (lift to all floors) and feature a walk-in shower only. From the M25, exit at junction 4. Follow the signs for Bromley and Orpington, until you reach a roundabout. Turn left and follow the signs for Dunton Green (A224). Travel straight on at the next roundabout and turn left at the 2nd roundabout (at the foot of the hill). When you approach the Rose and Crown Public House turn left. The Hotel is situated 300 meters on the right-hand side. From the M25, exit at junction 5 (A21 Sevenoaks). After approx. 1 mile, take the A25 signposted Sevenoaks. At the roundabout, turn left onto the A224 London Road. Travel straight on at the next 2 roundabouts, which will bring you into Dunton Green. After approx. 1 mile, turn right by the Rose and Crown Public House. The Hotel is situated 300 meters on the right-hand side.